We are now officially “American Tourists” in China! “I am getting a ‘foreigner’ high!” yelled Olivia. It was fun to hike down the Great Wall in the morning the next day after camping at Jiankou Great Wall. We happily came down from the top of the Mutianyu Great Wall meeting all the tourists who were climbing up. 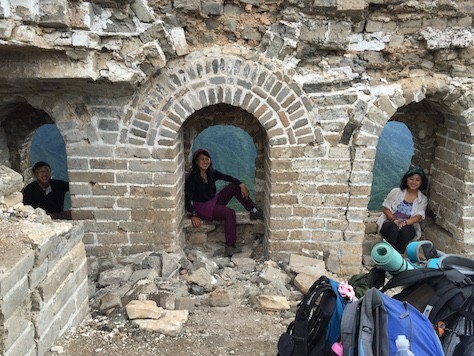 We each had our backpack loaded with tent, sleeping bag, floor mat, and water bottles hiking down the Great Wall of the Mutianyu section, one of the most famous section of the Ming Era Great Wall built around the 1300’s. 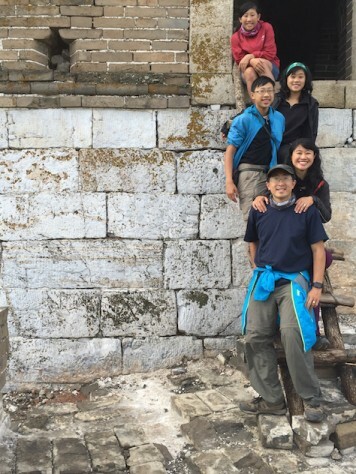 Earlier the day before, we hiked up the mountain and camped overnight on the Zhengbeilou Watchtower of the Jiankou (Cocking Arrow) Great Wall. This section of the wall has not been restored for hundreds of years and only photographers and avid hikers go to this section because it is known to be dangerous. 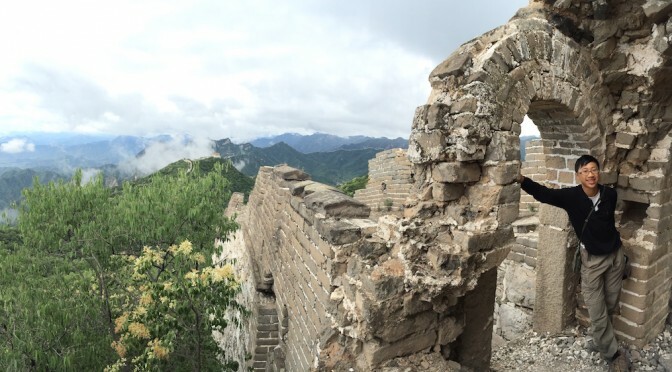 This section of the Great Wall follows a W shape path, thus it got its name. The sunset on the watchtower of the Jiankou Great Wall was one of the most spectacular one we had seen. We were at the highest point and all around us were lush green mountains and crumbling walls with overgrown bushes and trees. 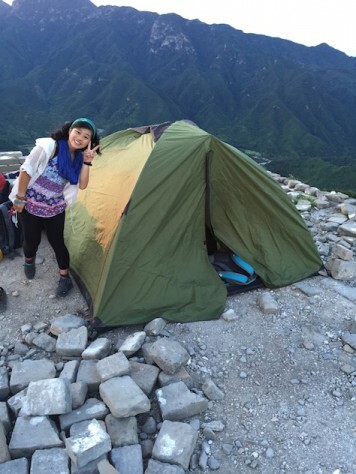 We had the entire tower and the surrounding walls all to ourselves as we tented overnight. We pitched out tent on top of the best viewing point in Jiankou Great Wall. At 2AM, rain started pouring. Nathan & Jonathan went inside the tower to spend the night. This was the tower we slept on top at the Jiankou Great Wall. The Great Walls were not built on valley or flat plain. They were built purposely along the ridges of the mountains with an average of 7+ meters height and sometimes reaching 14 meters. We were amazed that it does not matter how steep the mountain ridges rise, the Great Wall follows it closely as if it is drawing the contours of the mountains. 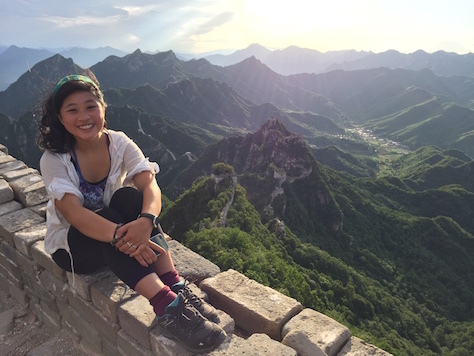 Olivia sit at the edge of the watchtower enjoying the gorgeous sunset scenery. Can you guess what four numbers are these? The trees encroaching on the wall and the floating clouds are so magical. The next morning it was mostly downhill as we had done the hard work the day before. 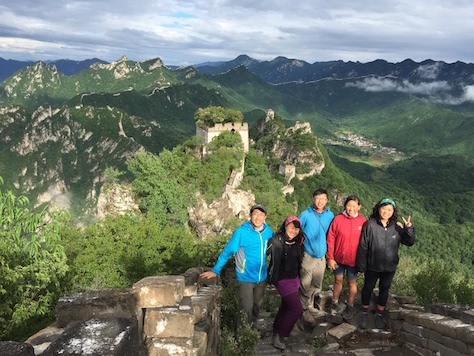 We were walking in the opposite direction from all the tourists who were climbing up because we started from Jiankou Wall direction and was hiking through the far end of the Mutianyu Wall towards the incoming tourists. Everyone we saw looked at us with amazement, probably thinking how we were able to climb to the top so quickly and to have already come down! 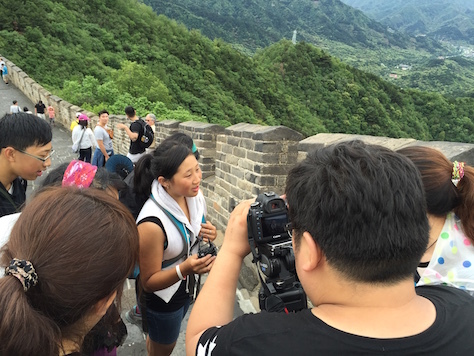 Even a TV station who was interviewing tourists on the Great Wall stopped their interview and ran toward us not wanting to miss interview us. Our family laden with backpacks and tents caught the attention of the TV station who interviewed our whole family. Similarly we were amazed at seeing so many foreign tourists. Around every 10 people that we walked past, 8 were foreigners. 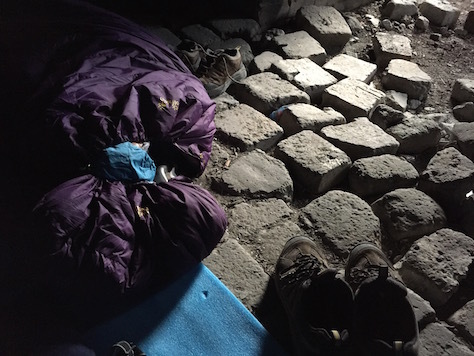 And they were not the type of backpackers, couchsurfers, and long distance cyclists that we had come to be familiar with through our travel or through hosting them in our home over the past 4 years. Jiankou Wall which has not been restored was built 700 years ago. “I want to go there,” a boy around the age of 6 pleaded with his mother. We couldn’t stop laughing because the scene was exactly the opposite of our family culture. Instead of the boy pleading to go there, it is me who is challenging my children to see who can reach the top first. And whoever can reach the top will be the one who has the popsicle! 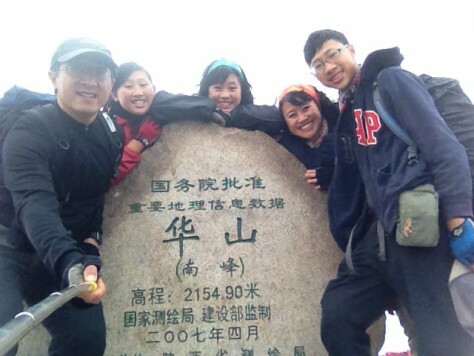 We reached the top of Huashan, the South Peak at 2154.9 meters after 9 hours. 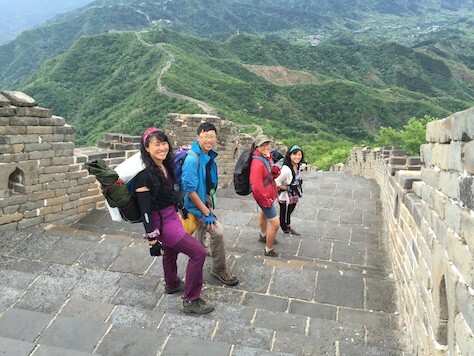 For the first leg of the one year Silk Road adventure, the children demanded to see the Great Wall in Beijing, the Terra-cotta Warriors in Xian, and to climb the Taoist Huashan Mountain, the most western of the five infamous holy mountains of China. 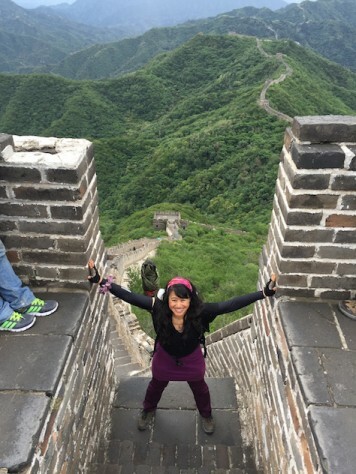 “When I go back to America, if my friends asked me if I had been to the Great Wall or to the Terra-cotta Warriors, I would be so embarrassed if after living for 14 years in China I had not even been to these places,” Olivia pleaded. On the West Peak, the clouds appears and disappears constantly. The sceneries climb up from the bottom of the mountain were amazing. Nathan and Joani also wanted to go because they had gone to local Chinese school until fourth grade and in their language textbook, it described the amazing feat of the creation of the Terra-cotta Warriors tomb site, the larger than life building of the Great Wall, and the religious importance of the 5 holy mountains of China. 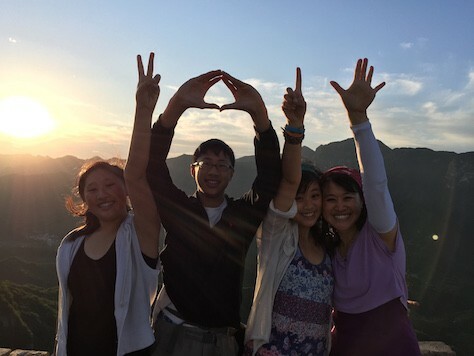 It was interesting how our children also felt the same urge as the mainland Chinese tourists had to see Sun Moon Lake and Alishan in Taiwan because they were part of their childhood dream as well. 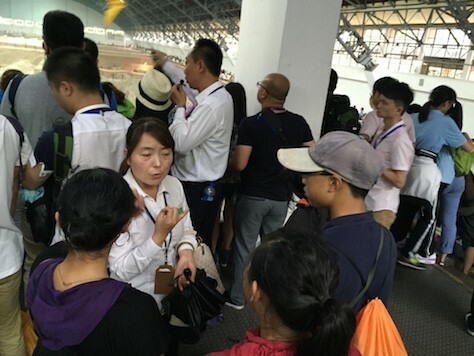 It is with such motivations to “save face” and to “touch” the places described in the their Chinese textbooks that we planned our first leg to be Xian and Beijing. I was glad that we did. These places were truly amazing. Clouds rise quickly up the cliff of the East Peak made us felt as if we were riding on clouds. 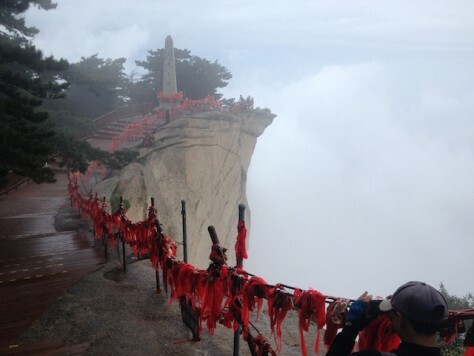 Although it was raining when we began our ascend from the Yuquan Taoist Temple at the bottom of Huashan Mountain at 6AM, after ascending vertically 1700+ meters on more than 8000 stone steps, often right on the ridge of sheer cliffs, the gloomy weather was transformed to magical sea of clouds that were every changing with every turn of the wind. 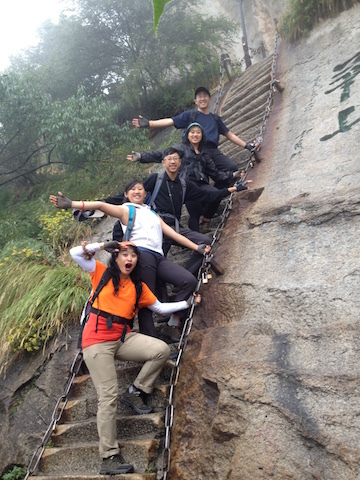 The Heaven Ladder was so steep that at one point, we had to pull ourselves up using only arm strength. It was scary just standing next to the sheer cliff down a thousand meters. Some people climbed the planks here. 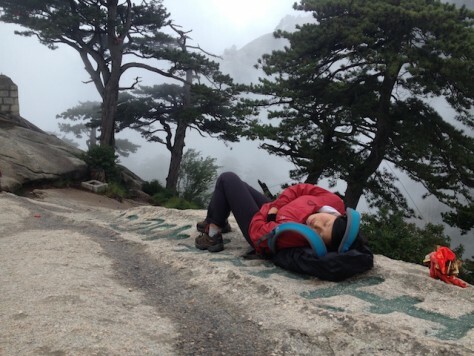 It was a long 12 hours of hiking. 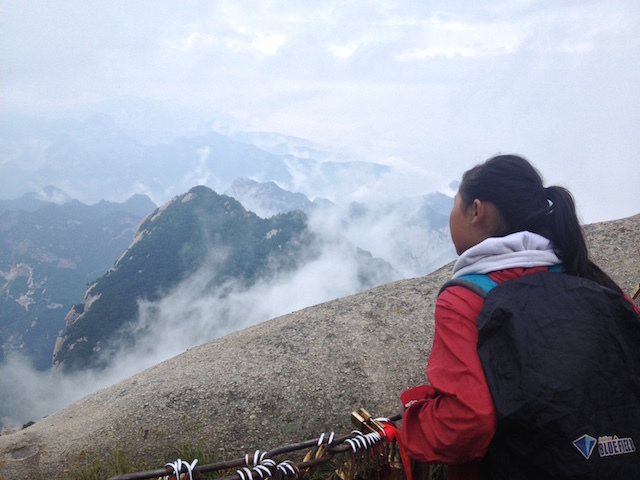 We climbed up to all five peaks of Huashan, the north, center, east, south and west peaks, with the South Peak the highest at 2154 meters. At the East peak, the wind blew the cloud up the straight cliff face of the East Peak.It felt as if we were riding on top of the clouds. Hiking up from the bottom of the mountain, we had to pass through very steep rock face that consists of 370 steps craved into the cliff. There was one face (Heaven’s Stair) that even overhang such that only our arms were carrying most of the weight. 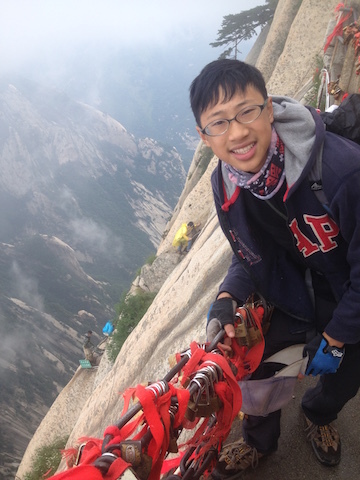 At the West Peak, we hiked precariously on the ridge of a rock ledge with cliffs on both the right and the left. We climbed so many stone steps such that the bottom of Olivia’s old hiking boots broke and we had to buy a new shoes in Xian. Joani was tired and hungry by the time we reached the East Peak after 8 hours. Joani was very hungry around mid-day and demanded hot cooked food or else she will not take another step. I warned her that the food is very expensive but she still wanted to eat something hot. I relented and asked for the price of the instant noodle. “RMB 24?” Joani was in shock. “Okay, dad. You win. We shouldn’t buy here.” (RMB24 is 6 times the normal price). Reflecting back, I think my action of asking for the cost of the noodle made Joani felt that I cared about her needs. The fact that we didn’t buy it didn’t matter anymore because her “emotional needs” have already been fed. Despite the tiredness and lack of food due to the high price of food all the children unanimously agree that they were glad that they did it. The moment we stepped into the pit, we all exclaimed in awe. The next day we went to the obligatory tourist hotspot at the Terra-cotta Warriors, besides the tomb of Qing Shi Emperor. We were told to hire a guide and we were glad we did. The guide helped us to get free tickets for Nathan and Joani, and Olivia only had to pay half price as a student! The guide was a very gentle and motherly person such that we feel quite at ease listening and following her through the 3 excavation pits. Each terra-cotta warrior has an unique face. 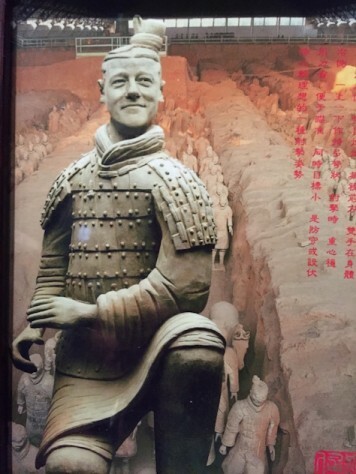 Here is one based on president Clinton! We never knew that originally all the warriors were very colorful. 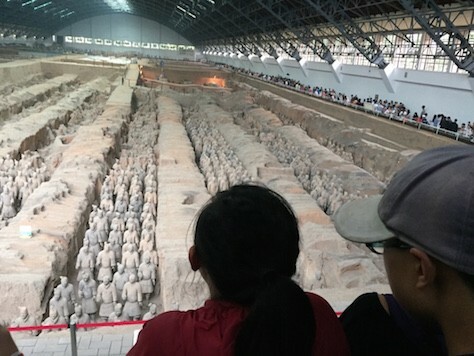 The moment we stepped into the first pit, we felt our heart stopped as we were in awe at the massive size of the pit and the almost 8000 clay soldiers rows after rows, each with a distinct facial feature. We couldn’t helped but rushed towards the railing, fighting our ways through the thousands of other tourists to get as close as to the clay soldiers as possible. Although first discovered more than 40 years ago by a farmer, excavation continues today especially in preserving the original colors of the clay figures. “They look bigger and taller than I thought from the pictures.” Joani sighed. 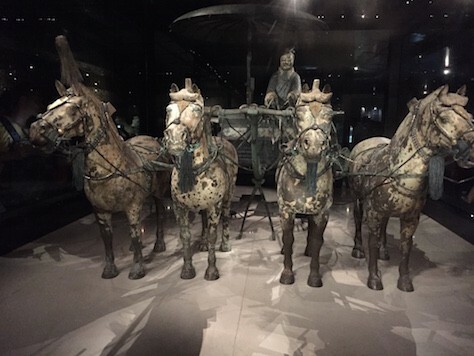 These bronze chariots were very intrically made, making them very life like. Despite the large size of the view area and the myriad of different tour groups passing through there, we naturally singled out the many American tourists there. In our years of living in Yunnan and in the villages, we did not encounter many American tourists, as they tend not to be the adventurous, backpacking type. So it felt like a novelty to see so many of them all together at once. 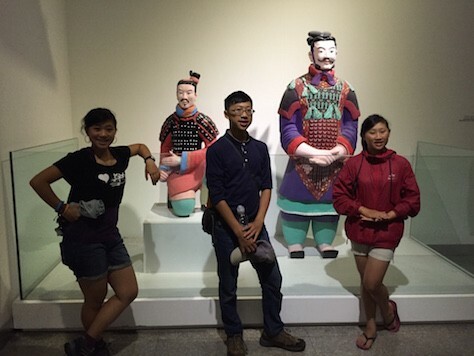 After seeing the Great Wall and the Terra-cotta Warriors, the children made a solemn conclusion: there must be an unspoken rule that when American tourists come to China, climbing the Great Wall and seeing the Terra-cotta Warriors are two must do activities. So with the conclusion of the first leg in Xian and Beijing, we have now officially become “American Tourists” in China! 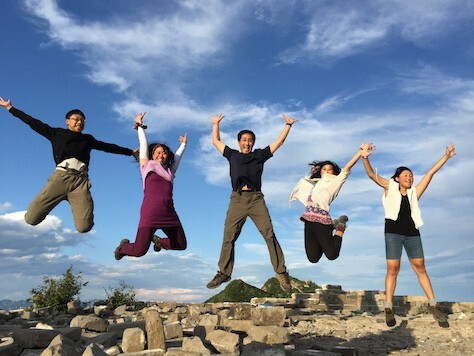 We jumped on top of the Zhengbeilou Watchtower of Jiankou Great Wall. 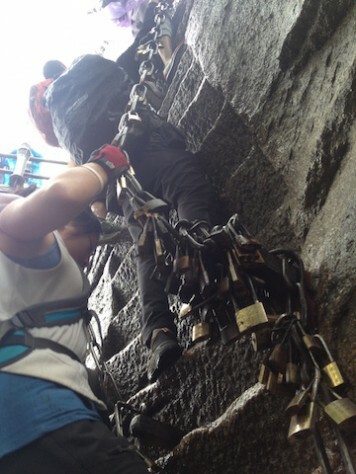 No, we left our big backpack in Xian. We are not that crazy.